The colour is a lovely orange and although it looks like a hi-lo hem, it's not. Because I screwed up the waist radius calculation, I had to take in about 25cm and just improvised two giant tucks centre front and back. I hope to have pictures of me modelling all the skirts, but maybe after my holiday. On with finishing number 2. Looking good. Maybe your sewing mojo has returned! Necessity is the mother of invention and by the time I finish these, my mojo will have gone again. Wow that's fabulous @UttaRetch . 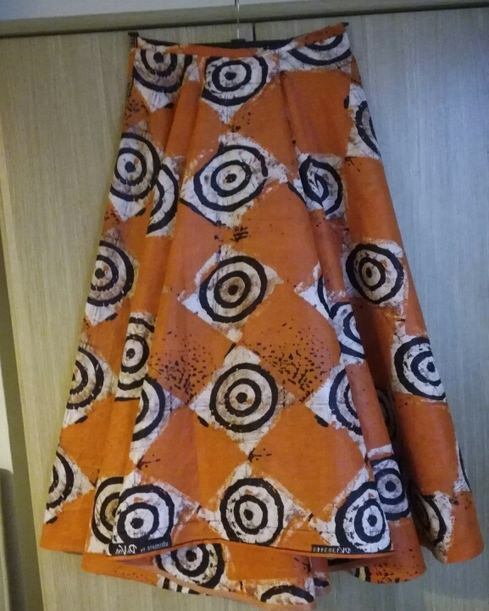 Is the fabric a wax print? Hang onto that mojo- you are doing a great job! That will look fab Utta with your enviably small waist. Hope the next 2 work out as well as the first. Great looking skirt, I love the fabric! Well done UttaRetch, that skirt is lovely and just the beginning, I am sure you will find the other two will go together much more quickly. Now do not be surprised at what fabrics you will find in New York, hope you have room in your luggage for the haul, and then you will be itching to get stitching once you get home. You never know a new home may be on the horizon and a returned sewing mo jo!!! Have a wonderful time wearing your new skirts – you clever lady. I also seem to remember a very pretty one that you just made up quickly when your sister had a birthday, that looked lovely – are you still wearing this? @Manuela: print placement is accidental. I had to take up the slack in the waist and just made massive tucks in centre front and back. Second skirt and again, the camera colour is off. The purple is, in fact, a lovely cerise pink. Horrible handsewn zip - I just don't get them - dodgy top stitched hem and only partial success with stitching in the ditch. For the final skirt, I just going to do a wrap around and extend the waistband into ties. I don't have the time now as I still don't have currency or a case. I also have to try and get a hair appointment as well as dealing with my car insurance renewal, which expires just before I leave. I normally ask my sewing teacher to take photographs, but I have no time to go to her before next Sunday as there is still lots to do. You'll have to wait until I get back. 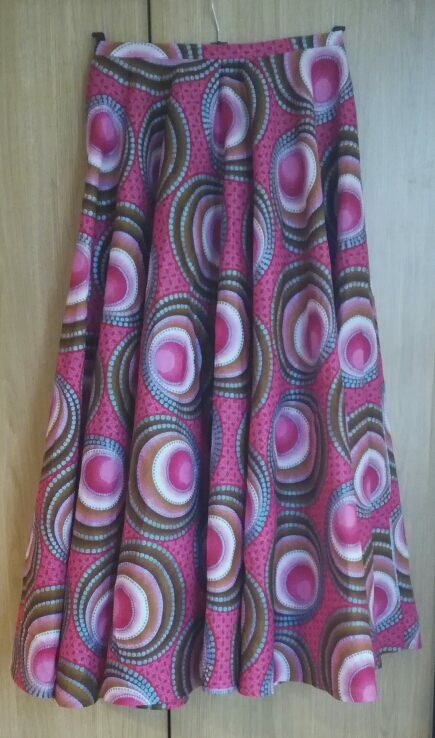 The third skirt is a big wraparound as I just couldn't face another bodged zip. I am going to finish the hem with bias binding. I have to sew on press studs on the waistband extension of the skirt above and that will be the end of my rushed holiday sewing. Phew. You've definitely got your mojo back! Nothing like a deadline! Your skirts are lovely, have a wonderful time in NY.